We are a well-established manufacturer of tube cleaning equipment, tube cleaning machine, dry tub cleaning equipment suitable for dry application & wet application. The different types of dry tube cleaning equipment that we offer includes wire brushes, tool head cutters, electrical tube cleaners and more. Precise, effective and cost-saving are the Tube Cleaning Equipment offered. 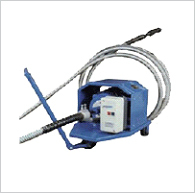 The cleaning machine is easy to use & require little training / experience to operate. We supply variety of tube cleaning equipment, flexible shaft machine, tube cleaning machine, flexible shaft, flexible shaft tools, tube cleaners, flex shafts, flexible shafting equipment, flexible shafting machine etc. It is a 3 phase electric motor (2800 rpm) mounted on 3 wheel trolley fitted with a carrying trolley. Horse power of motor is selected depen-ding upon the length & size of shaft, and type of scaling. Push button starter is provided to control the motor. Each machine is fully wired, carefully tested & fitted with a 10 ft. Length (Or longer if required) PVC cable to main supply. Motors are available in enclosed system as well as in open system (i.e. Without covering of above motor. Please contact us if your electrical specification is different from below mentioned. Machine for alternate supply are also available. Model No. Motor Power Electric Supply Speed RPM Tube I. D.
It is used for cleaning of tube by transmitting power in terms of rotation from the motor unit to tool head cutter or brush within tube. Inner Core : It is flexible wire with multiple wound opposite layer. It is made of high tensile spring steel or stainless steel (as per requirement) and passed through heat treatment processes to make it absolutely vibration free. Outer Casing : It is flexible, double interlocked, circular rounded, made of galvanized steel strip, Special spring steel lining is provided within outer casing to avoid any friction between inner core & outer casing. Connection : One end of shaft with machine end socket is attached to suitable motor and other end is attached to tool end. Purpose : For rapid removal of hard scale. Description : It has 15 cutter wheels (4 straight wheels, 4 left wheel, 4 right wheel & 3 bevel wheels). They are spring loaded &selfexpanding. Size : For tube I. D. From 31mm to 53mm. Address	: 107, New Modella Indl Estate, Padwal Nagar, Wagle Estate, Thane (W)-400604. Maharashtra, India.